SEO for Mobile- Free Android Mobile Apps to help you out!!! Search engine optimization has changed a lot since its beginning and has grown ahead in its scope, use and impact over the years. It has evolved much from keyword stuffing than a more semantic, mobile friendly and context based search results. Now, you can’t fool around with search engine spiders, indexing bots or web crawlers with an illegitimate, unnecessary keyword stuffing as it lead to severe penalty from search engines like Google, Yahoo, Bing and such others. Apart from this recent Google algorithms like Google Panda, Hummingbird, Mobile Friendly and other such have brought the focus towards websites being more mobile friendly to rank higher on search engine result pages (SERPs). If you want to improve the popularity and worth of your site on mobile phone search results, you need to start paying attention towards these free Android mobile apps for search engine optimization. SEO Keyword Tool for Google provides detailed information about keywords for a particular product/service. 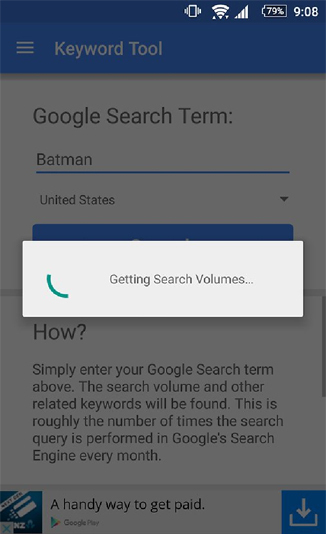 There are several instances when you are roaming somewhere or is present at a location away from your office desktop and suddenly you need to provide report about the keywords or want to search the related keywords for a particular product/service. In the above circumstances, your life could become much easier if you are having SEO Keyword Tool for Google mobile app at your side. The user just have to enter a word or phrase into the SEO Keyword Tool and it will provide an accurate data about how many times a particular word or phrase has been searched in the Google for a given month and in a particular year. In addition to this, the tool also provides information about the six other closely related keyword phrases. By default, the statistical data of the tool is set to U.S. but it can be changed as per your location while entering a particular keyword phrase. It has definitely emerged as an exceptional SEO tool in the mobile app development process and has been getting rave reviews from SEO professionals around the world. 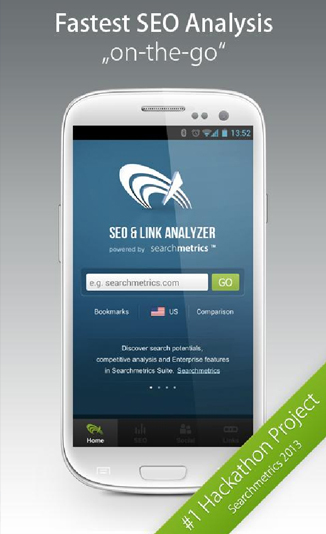 SEO & Link Analyzer mobile app offers crucial data about search engine result pages and other related metrics. 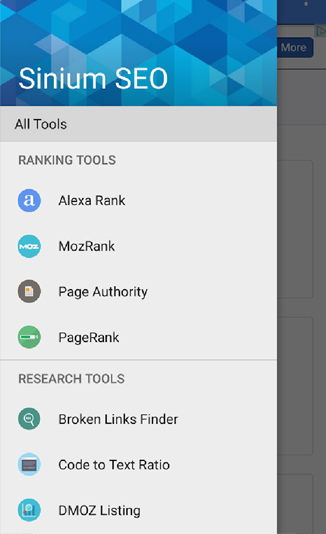 SEO software platform, Searchmetrics has come up with this wonderful SEO & Link Analyzer mobile app for improving its mobile search engine rankings. It can help users analyze website URL for search engine result pages, identification of domain links, monitoring of social media signals generated by URLs, pay- per- click visibility and much more. It is definitely a feature packed mobile app when you want a quick insight about the top ranking keywords of a site, statistical report of competing sites and other such data in a user friendly format along with the presence of help buttons on each screen. The tool is available for free of cost to non- customers of Searchmetrics also but dedicated Searchmetrics customers can enjoy more features and functionalities with their expanded options in the web tool. SEO SERP Mojo Rank Tracker tool offer users detailed view about ranking reports. This SEO SERP Mojo Rank Tracker is helpful for tracking the history for Google, Yahoo and Bing. It is an unique app that allows user to view and download the ranking reports. With this free SEO tool, you can get unlimited keywords on an unlimited number of URLs. It is also available with a $3.99 Pro version that provides extra features and automatic rank checking updates for achieving a regularly updated chart. 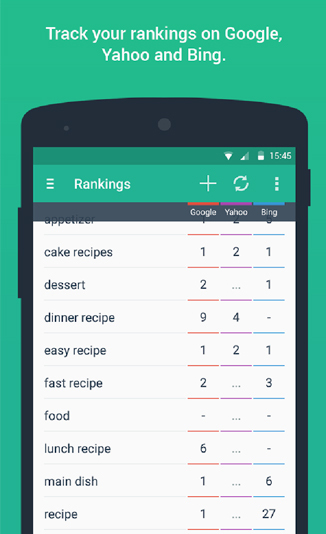 This mobile app ensures ranking numbers that are matching rankings data from other available tools. This SEO tool comes packed with multiple features for ensuring effective SEO services for mobile sites. When you have to utilize SEO and technical tools in one single app, you need to go out for this Sinium SEO Tools. It consists of a wide range of working features that are bundled into a single SEO tool like this and are mentioned below. Mobile Friendly Test- You need to tap into Google’s API for analyzing the mobile friendliness of a web page which is considered as one of the significant factor in mobile search results. Source Code- It offers the source code for a particular URL. Spider Simulator- With this, you can show metadata and links on a page for any given URL. Server Status- It provides insight about server performance statistics like response time. Website Speed Test- SEO is based on the quick loading time and better user experience of visitors. Domain Tools Category- It consists of multiple tools that are required for domain registration, hosting and IP address. 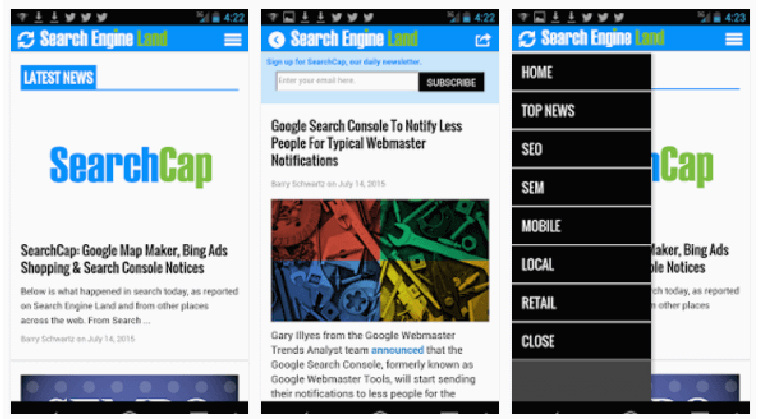 Get quick news notifications and more with the help of this Search Engine Land tool. When you need to access quick updates while traveling or roaming anywhere, nothing beats Search Engine Land as the most trusted platform for search news on your mobile phone. It provides a wide range of services like breaking news notifications, browsing through channel and comments by expert industry. By having these crucial Android mobile apps at your side, you can improve the search engine rankings of your site on mobile search engine result pages (SERPs). These are part of some of the handy tools that can take your mobile site to new heights for achieving a comfortable position on major search engines like Google, Yahoo, Bing and such others.